I am Arva Attarwala and am a Henna artist. 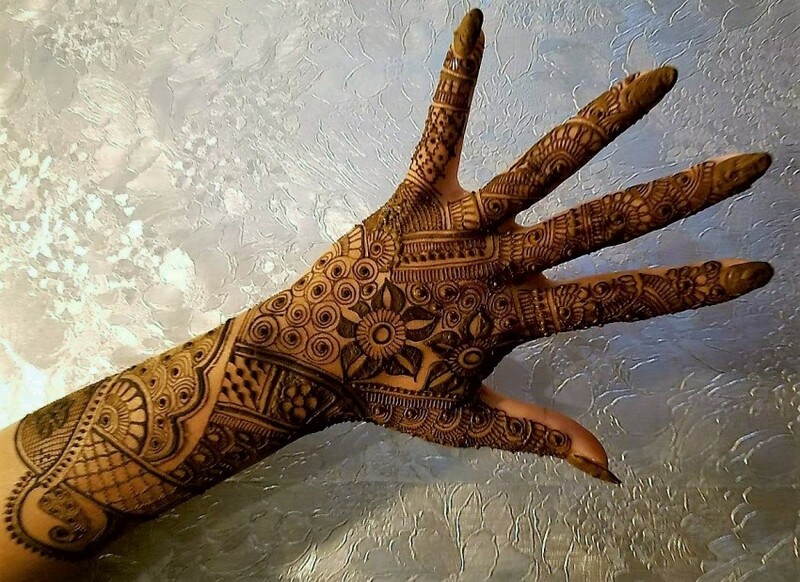 I do henna tattoos and intricate henna designs for all sorts of events like birthday parties, sweet sixteen, bridal showers, Girls Night outs, bar mitzvah, fund raiser, theme parties, graduation, festivals, bridal, sangeet, corporate events, store openings etc. 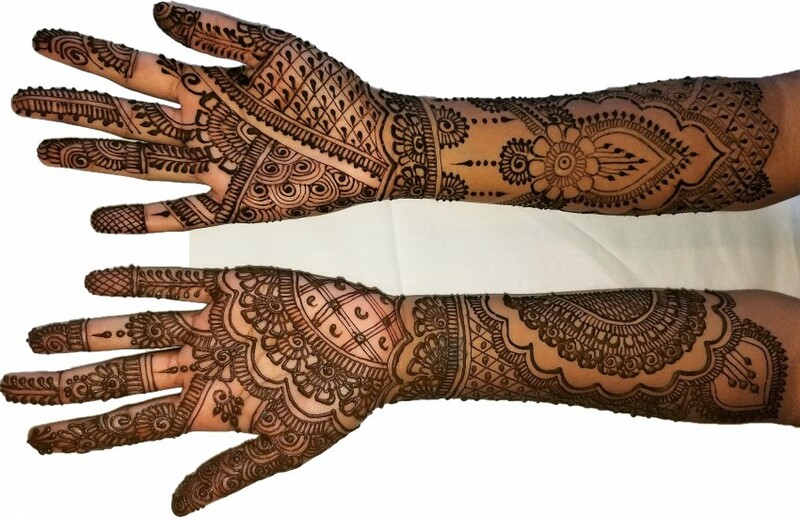 Variety Entertainers – We at Arsaat Party Entertainers, LLC also provide Henna tattoo artist, Face painter, Balloon twister, Air brush tattoos, etc. Inquire for package deals. We also provide henna tainted customized party favors. Arva was amazing! She free handed my henna for my wedding, and I have received so many compliments! I highly recommend her. I was trying to find a henna artist at the last minute for my mosque Eid Celebration . Arva not only got back to me right away she was also available for the day and time I needed her for. Communication between Arva and I prior to event was great. We spoke mostly over the phone then by text which I really appreciated. On the day of the event she arrived on time and setup promptly. Arva was a wonderful addition to the Celebration and It was a pleasure working with her. She's very professional, patient, polite and talented. Her freestyle designs are fabulous and everyone who attended kids and adults wanted henna done. Also to top it off as the host I usauly miss out on getting my henna done. However Arva insisted that I do and so I did and I Loved my henna and most of all really enjoyed the experiance😊. Thank you Arva for making it a memorable event !!! Looking forward to booking you again. I highly recommend having Arva for your next party or event. Arva did a fabulous job on my hand! The henna was detailed, precise, and neat. The henna was natural and the color came out nice and dark the next day! I would recommend her to anyone. She also is a wonderful, and sweet person to talk to ,who takes her job very seriously! Love you Arva! Arva was pleasant, calm, and easy to talk to. She seemed to capture each person's personality in the Henna design she did on them. Everyone loved the experience. The two of us hired Arva to come to our home two days before our wedding and do traditional wedding henna on our hands, both sides; halfway up our arms, both sides; and the tops of our feet. Arva worked enthusiastically and tirelessly for about seven and a half hours to complete this work. She instructed us carefully how to take care of the henna as it set for the first day or so, and how to take care of it for the days following. She uses all natural ingredients. We highly recommend her. At the last minute I planned my daughters 10th Bday Party Sleepover and I thought long and hard about adding a form of entertainment which brought me to Arva. It was the best decision I made. It bumped the party All the way up to perfection. The look on my child's face not to mention the adults who benefited by getting there own tattoos. Arva came in and set up in about 2 minutes. She was ready to create her exclusive artwork and so she did. She came with some pictures to choose from on the side but once everyone saw her freestyle we all wanted her to create her masterpieces for us. I am so glad we hired her and would do it again in a heartbeat. The only thing I wish is that I as the host could have gotten one down my hand like I wanted to. It's been almost 2 weeks and our tattoos still look beautiful if not even better. Thank you Arva for your professionalism, patience and beautiful henna tattoos. Arva was wonderful, polite, professional, and talented. She was a great addition to my party and everyone in attendance wanted a henna design. It was a pleasure to work with her on this event. I totally recommend her to all! Arva is a true professional and a pleasure to work with. Her designs are beautiful and she works so quickly! Arva was the highlight of our daughter's 13th birthday party. She patiently created gorgeous henna tattoos for our 17 guests (girls ages 12 - 14), who were thrilled with the results. We highly recommend her. We had Arva come for our daughters 14th birthday party. She was the hit of the party for the 17 girls who attended. Arva's skill was amazing. She free-handed the most incredible designs. Every Henna was different and all the girls were thrilled. We highly recommend having Arva at your party. I have got my Henna done by Arva, twice and both times, I loved it and so did my relatives and friends. Can wait to book Arva for future events! Just wanted to thank Arva Henna for a wonderful time , you did a great job on our Christmas Party , everyone enjoy there Henna and Caricaturist. Everyone loved their henna tattoos including me. They looked great the next day and we loved how everything was done by free hand. It looked awesome for the wedding. Thanks again! Wonderful to work with and amazing talent! Arva was such a pleasure to work with. We held a block party at our school that the students organized. They wanted a henna artist, and Arva was willing to work with us to make the event happen. She brought all materials needed and was able to create spectacular designs that our students and teachers are still talking about. I would highly recommend her for any event! We booked Arva to do henna at Rider University's Artbeast Festival, and were truly impressed. She arrived on time and ready to go, and did some of the most beautiful henna for a constant line of people for two hours. These ranged from small images, like an earth, to full hand or ankle pieces, depending on what was requested. She is friendly and professional, and extremely talented. We loved having Arva at the event, and would love to have her back in the future! Arva was amazing!! Amazing artist, friendly personality and all around a lot of fun. I would recommend her for anyone looking for a henna artist. Arva was prompt to start on my henna, Was through in going over what e had previously discussed as well has added any notes and ideas of her own in a positive way. The detail in her work is amazing and while being amazingly intricate she also wasn't slow with her work. She was pleasant to talk with and knows the background and how to care for her craft. It was a pleasure working with Arva. The problem with parking in my neighborhood came as a surprise, since most of my NYC friends and family visit by the many mass transit means available and none of uses use a car. I suppose I should have recommended that she use commercial parking when it became clear that it would be so difficult to find parking and result in an hour delay to the start time. 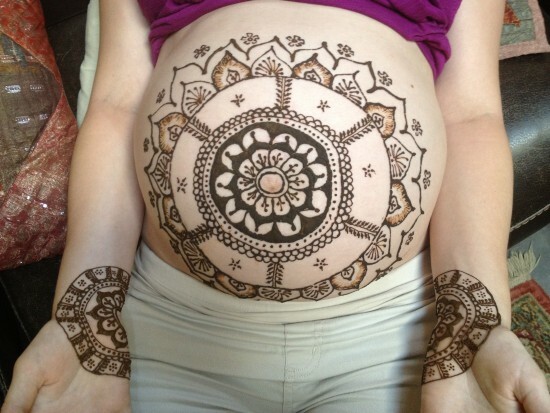 I had initially selected henna artists to contact who had NYC listings and started with those in Brooklyn. So I feel that the NYC listing was a bit misleading. Still, all of our guests were charmed by Arva and love our beautiful mehndi. I hired Arva to do Henna at a friends Bridal Shower. She Arrived in a timely fashion, as the party was a surprise, and was very easy going about how her arrangement was set up. She requires only a table to work at. During the time she completed Henna on every guest at the party and each persons Designs were all very individual and different from one another. She works very quickly and efficiently and does gorgeous work! Everyone was in love with their henna, and Arva even gave recommendations to help the Henna stay longer. Her products are 100% natural and she explained the entire process of how the all natural henna is made. It smelled fantastic like lemon, and lasted on my hands for 2 weeks! She was very friendly and professional and handled all parts of the booking and payment very well. Hi Arva. Thank you so much! Everyone really enjoyed their tattoos! You were a huge hit! Thank you again for doing such a wonderful job at the shower for my daughter. Everyone loved the henna designs and the beautiful candles.It was also nice having you explain about the henna. It is good when different people can come together and appreciate each others culture. My sister always says that if women ran the world there would be no wars. Anyway I just wanted to tell you how much we all appreciated having you-especially my daughter. Thank you Arva; it was great working with you! Thanks Aklima. It was great working with you as well. Your mom was way too sweet! The experience for my duaghter's Sweet 16 party was wonderful. Everyone, including me, was pleased with her manner, technique and artistry. We would definately recommend her to others! Thank you so much for the henna!! It looks great!! Thanks again; it's beautiful! It was the first time a friend and I had henna done... we both had wanted to get mehndi for quite some time. Working with Arva was a pleasure, she gave us a lot of information on the history of henna, how to care for it, and took the time we needed to find the designs we wanted. Her henna work is fabulous and I will definitely be reaching out to her again for future work. She has a wonderful personality and you can see the commitment she has in making customers happy. Arva is the most professinal and easy going artist I have ever met. We have been working since last 3 yrs and she is on time, unique designs all free hand, very flexible. She knows how to make customers happy and on top of it she is so fast. Can do upto 25-30 tattoo in an hour so hardly 2-3 min per design now thats a deal...You can completely rely on her for any of your henna needs if needed she also has other professinal artist working under her. Having Arva do henna tattoos at my daughter's 12th birthday party was amazing. The girls had so much fun & couldn't wait to show off there tattoos at school on Monday. Arva's work was beautiful, and she was very quick. Each girl was able get at least 2 tattoos! The children (8-11 year olds) and adults in attendance loved their "tattoos". All designs, even the most intricate, were drawn freehand and took about 5-7 minutes per person. The henna lasted about 2-3 weeks. My daughter, her friends, and my friends enjoyed experiencing this wonderful part of Indian culture. Oh my god she is terrific, it was a five hour event and we had 150 students and she was able to apply to all of them without taking a single break not even water. She is best of all. I was in Florida and has worked with henna artist before so I exactly know about their work and stamina. Arva is just the best, she has neatness in her work which is rare to find and her speed is incredible, in my 30 yrs of experience for organizing graduation parties this was the best choice I made. I highly recommend her for any event. She is just awesome. Very friendly and has a unique collection of designs. One of my cousin asked her to draw whatever she wants to and she did an amazing job. My passion to henna increased so much that I travelled Pakistan and all middle eastern countries to learn the different methods of henna with a unique creativity not only specializing in traditional intricate henna designs but also ethnic, modern, contemporary and exotic patterns. I can do almost any design and make the client happy!!! We are the leading Henna Tattoo (Mehndi) artists, dark henna color that last anywhere between one to three weeks. All natural products with a unique creativity, years of experience and skills developed in India,Pakistan and middle eastern coutries. We specialise in traditional Intricate Indian designs, ethnic, Modern, Contemporary designs and exotic patterns on various parts of the body. Or any occasion to make it special and memorable. we assure you of a very professional service with very competitive rates that any age group can enjoy. We guarantee you will not be disappointed! Bellmawr, Moorestown, Haddonfield, and Marlton, NJ. I first hired Arva when I was working as an event coordinator for a social media company based out of Manhattan. Since contracting her initially for my very first event in 2012, I have recommended or hired her at least 4 times. Arva is a friendly, personable Henna tattoo artist whose true passion is making other people happy. Her ability to translate this passion into art is truly what sets her apart, and has clients coming back again and again. She had been invited to small and large scale events and in both opportunities she was still very sweet and worked beautifully on all who sat before her. Arva is a wonderful asset to any event or function. She adds a beautiful, ethnic cultural experience that is sure to take any middle eastern themed event to the next level. 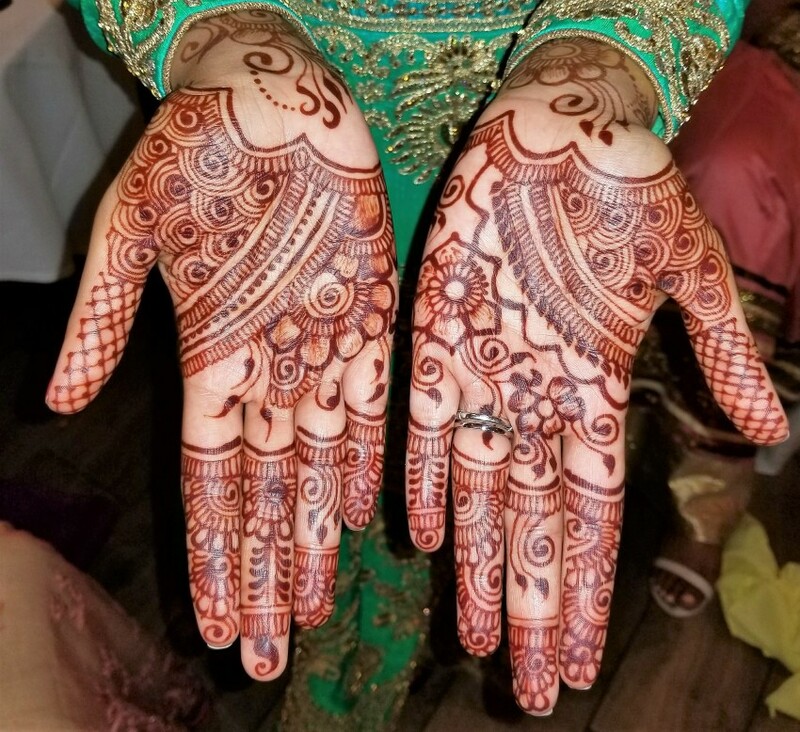 Her affordable pricing and helpful, cheery demeanor make her the perfect point person for all things Henna in the NYC metro area. She brings all of the materials and only requires a small table and 2 chairs. Please make sure to contact Arva and book her for your next happy hour, bachelorette party, wedding, bar/bat mitzvah's or just an excuse to get together and party.